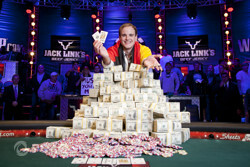 Pius Heinz Wins the 2011 World Series of Poker Main Event ($8,715,638)! 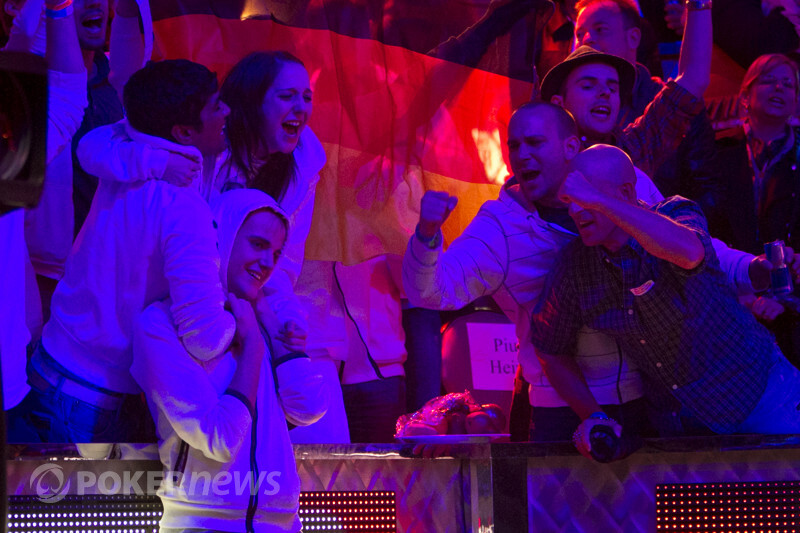 Pius Heinz: 2011 WSOP World Champion! It was months ago that 6,865 hopefuls entered the 2011 World Series of Poker Main Event for a shot at glory. On Sunday, just nine of them remained. Here today, there's only one man standing and that is German 22-year-old Pius Heinz. After 178 hands were played on Sunday to eliminate the first six players at the 2011 World Series of Poker Main Event final table, three of them returned to action today. Pius Heinz held the chip lead over Ben Lamb and Martin Staszko. The cards were in the air at 5:50 PM PT and we wouldn't have to wait long for the fireworks to be set off. On the very first hand of play, Lamb and Staszko went to war. Heinz folded his button and Lamb came in raising from the small blind to three million with the blinds at 600,000/1,200,000/200,000. Staszko put in a three-bet to 7.5 million from the big blind and then Lamb shoved in, having Staszko's smaller stack covered. Staszko made the call and the entire Penn & Teller Theatre was up on its feet. Lamb tabled the for two unsuited overcards to Staszko's . A rather uneventful ran out and Lamb was crushed back all the way to 12.7 million. Staszko saw his stack fly up to 85.6 million. On the very next hand, Staszko took the chip lead from Heinz. Lamb had the button and he folded. Staszko was counting out raising chips in the small blind and he made it three million straight. Heinz flatted in the big and off they went heads up. The dealer spread out , and Staszko continued out with the same three million. Heinz took pause to stare across the felt for a minute. He then made the call after about 30 seconds. The turn paired the board with the and Staszko checked this time. Heinz checked it back and the filled out the board. Staszko led back out with 4.5 million and that sent Heinz a bit deeper into the tank. It was at least a couple minutes before he grabbed at his chips and he decided to make a big raise to 14.2 million total. Another couple minutes later, the call came from Staszko, and it was a good one. Staszko's kings up were plenty good to win him the pot and he moved into the lead with 106.2 million in chips. He then earned more chips after busting Lamb in third place on the 182nd hand of the final table. Lamb moved all in for 10.9 million from the small blind after Heinz folded the button. Staszko called from the big blind after waking up to the . Lamb held the . The board ran out and Lmb was eliminated in third place for $4,021,138. The heads-up match between Staszko and Heinz saw Staszcko with the lead at first. He had 117.3 million in chips to Heinz's 88.6 million. From there, things would go back and forth over the following 119 hands. Over the course of the duel, Heinz was by far the more aggressive player. He kept constant pressure on Staszko in order to chip away hand after hand. There was one problem though, Heinz kept finding spots to give Staszko back a ton of chips and let him right back into the match. The common pattern seemed to be win, win, win, win, win, then one big loss to set it all back. Heinz made a couple of bad calls against Staszko that caused him to fall well behind and he seemed to be fading. Every time Heinz would start to chip back up, Staszko would whack him right back down the ladder. Then, on Hand #293, it was time to rock and roll for Heinz in order to get the bracelet right back in his grasp. 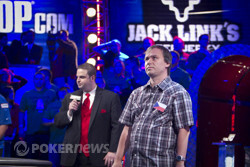 Staszko limped in from the button and Heinz raised to 7.9 million in the big blind. Staszko called it pretty quickly, the flop came and Heinz continued out with 8.2 million. The Czech was having none of it, though, and he raised to 17.5 million total, sending the decision back to Heinz. He spent a few moments thinking, then leaned back in his chair and sipped his water as he pondered. He shuffled chips for a bit, then leaned back over the rail to shoot a glance across the felt. A few seconds later, he announced his all-in reraise for about 70 million total! Now it was Staszko with the decision, and he doesn't normally tank for the camera. Indeed, the call came just a minute later and the cards were on their backs with Heinz at risk. "He's ahead!" Heinz's fans began to get giddy as they leaned in and gazed up at the monitors. The ace-queen was indeed the best hand, but Staszko was drawing live to the clubs and the nines left in the deck. The turn was the . Camp Heinz burst into another celebration as their guy was just one card away from a monster double. He just needed to fade Staszko's draws. The river was black, but it was the , and Heinz and his rail enjoyed a big celebration together. After that hand, heinz was back in commanding lead with 161.5 million to Staszko's 44.4 million. Just a handful of hands later, all of the money went in preflop after Staszko shoved the button for 39.5 million with the . Heinz called with the and this had the potential to be the end of it all. The flop came down and Staszko whiffed. The turn did give him a gutshot along with his live cards, but the on the river couldn't produce what he needed. The stage exploded in a frenzy of noise. Heinz rushed over to the rail to be mobbed by his fans and the celebration had officially begun. For Staszko, it's the end of a long, hard run. He really did play some fantastic poker for the past two sessions, and going back into July for that matter. When the dust settled, though, his run came up just one place short of a spot in poker's history books. The first bracelet will have to wait for now, but Martin Staszko is certainly a name you're going to be seeing again. The last image we have of Staszko is of him on the rail, head down, clutched in the arms of his supporters. It's all over now and Staszko will wake up with a consolation prize of more than $5.4 million. On the other side of the coin, Pius Heinz became the first-ever WSOP Main Event champion from Germany and earned himself $8,715,638 in prize money. He's also going to be rocking the most coveted prize in all of poker, the WSOP Main Event bracelet! Congratulations to all of the winners, but especially to Pius Heinz! He's worked hard and now it's time to party hard. As for the PokerNews family, we'd like to thank everyone for following along with us all WSOP. It's be another great Series and we couldn't be happier to have helped write several new chapters in poker's history books. Our pleasure as always and we can't wait to do it all again soon! Martin Staszko had the button, and he open-shoved all in for 39.5 million. This time, Pius Heinz squeezed out a good one, and he made the quick call with his covering stack and a chance to win it. The tension in the room became palpable, and the fans from both sides began screaming for their cards. "Ace! Ace! Ace!" Heinz fans yelled in unison, while Staszko's contingent were cheering just as fervently for their guy. "Staszko! Staszko!" With the theater rising to a deafening roar, the dealer burned a card and ran out the first three cards of the decisive board. It came . An awkward moment lingered briefly as neither side had reason to erupt just yet. After the initial indifference quickly wore off, though, the noise began to grow again in anticipation of the turn card. It was the , giving Staszko another four outs to the win. He needed to catch any seven, eight, or ten to double back into contention. Ten outs once. Ultimately, the smiley man from the Czech Republic could not get there. The river was the final card of the day, and stage right exploded in a frenzy of noise. Heinz rushed over to the rail to be mobbed by his fans, and the celebration has officially begun. For Staszko, it's the end of a long, hard run. He really did play some fantastic poker for the past two sessions, and going back into July for that matter. When the dust settled, though, his efforts came up just one spot short of poker immortality. The first bracelet will have to wait for now, but Martin Staszko is a name we're likely to be seeing again. The last image we have of Staszko is of him on the rail, head down, clutched in the arms of those closest to him. The smiley man was suddenly saddened. It's all over now, but he'll will wake up with a consolation prize of more than $5.4 million in the morning. That should help take the sting off a bit. Pius Heinz started the hand with the button. He raised all in and won the pot. Martin Staszko had the button, and he limped in for the minimum. Pius Heinz took a free flop, and off they went. It came , and that's as far as they got. Heinz bet another 4.8 million, and that was enough to win the pot. Pius Heinz had the button. He raised to 4.8 million and won the pot.